Most people probably don’t know Knoxville has its own city flag, but it’s catching a fresh breeze this year, thanks in part to the city’s 225th anniversary, which culminated this month. It was designed in 1896 in time to represent the city at the Tennessee Centennial in Nashville. It would be the biggest fair ever held in Tennessee in that century, and Knoxville was invited to represent itself in Nashville’s Centennial Park with its own city pavilion. To go with the Knoxville pavilion in Nashville, a young local attorney proposed that Knoxville have its own flag. Horace Van Deventer was a 29-year-old Harvard Law School graduate originally from Iowa. He had lived in Knoxville for only three years, but it was a busy, exciting city, and he was already proud of it. The Chamber of Commerce liked the idea, and sponsored a prize for the best design. Though it was claimed to be a “nationwide” contest, the winner was Knoxville’s best-known artist, Lloyd Branson, whose studio was on Gay Street, near Clinch. Branson was best known as a painter, and had dabbled in sculpture and photography, but he had never designed a flag before. Branson’s flag, Knoxville’s first flag design, was laden with symbolism. The black stripe was meant to represent coal, the white stripe marble. (Other sources claim the white represented faith, others that it was an homage to Knoxville founder James White!) Nine stars symbolized the nine city wards. The golden winged wheel represented progress. Within the wheel are a derrick, as one might find in a marble quarry, then one of Knoxville main industries; crossed picks represent miners; a locomotive transportation and commerce; and a factory, manufacturing—with an extra blue and red square to represent bravery by one account, loyalty and harmony by another (and by still another, war!). Lawyer and author Joshua Caldwell presented Branson’s flag to Mayor Samuel Heiskell, and to the Knoxville public, in a ceremony at City Hall on Market Square, 120 years ago this week. Nashville, the state capital, was sometimes called “the Athens of the South,” reputedly for its educational institutions, and built a replica of the Parthenon in Greece. Along the same lines, Memphis, which is named for an ancient city in Egypt, erected a pyramid. The Knoxville Building was less extravagant than those two, but a dignified two-story Romanesque white building, designed by the Knoxville firm of Baumann Brothers, with wings and four small tower “observatories” on each corner. Although it was painted to look like marble, it was built mostly of wood. The United States flag and Branson’s new Knoxville flag both flew over the Knoxville Building for the six-month duration of the fair. Knoxville was so proud of the building that the city moved it to downtown Knoxville after the fair, and erected it on Main Street across from the courthouse, where it was known as the Women’s Building, serving as a location for art exhibitions and balls—until it burned down as a result of Christmas fireworks in 1906. The Knoxville flag, rarely used after the exposition, was sometimes forgotten altogether. One problem was its intricate design, which called for so many different colors and shapes it was expensive—twice as expensive as a U.S. flag—to produce. However, it has seen several revivals over the years, notably during the city’s sesquicentennial in 1941, when it underwent a redesign, including a correction of the year. The city’s founding date—that of the real-estate lottery considered the city’s founding event—was long based on one old man’s memory as having occurred in February, 1792. However, librarians proved in the early 1930s that it actually happened four months earlier, on Oct. 3, 1791. So they made that change, and some less-obvious modernizing of the figures. By the end of that year, new Knoxville flags were being sold at downtown department stores like S.H. George’s. The flag was almost forgotten again after World War II, until Valley Fidelity Bank ordered a new copy made in 1965, to fly above its Market Street headquarters, spawning a revival of interest. In 1967, Capt. Donald Severance, a U.S. fighter pilot in Vietnam who earned three Distinguished Flying Crosses, became known for displaying a Knoxville flag on his plane’s fuselage. 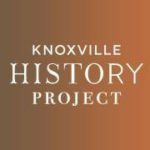 Knoxville’s 225th anniversary, combined with a revival of interest in all the work of artist Lloyd Branson, has gotten people talking about the flag again. 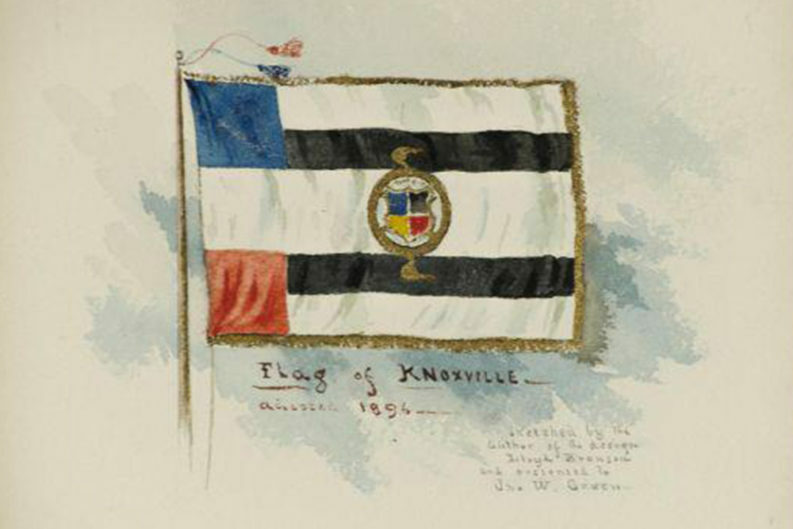 Featured Photo: Artist Lloyd Branson’s original 1896 sketch of the first-ever Knoxville Flag. Image courtesy of the City of Knoxville. Compiled by Jack Neely for the Knoxville History Project.